After learning that Gerhard Richter’s painting fetched $34.2 million at auction at London’s Sotheby’s last Friday (over twice the amount estimated), I couldn’t help but run some numbers in my head. Thanks to his meticulous catalog on his web site, which includes a searchable database of works and selling prices for certain pieces, I was able to further fathom the painting machine that Richter is. Love it or hate it about him, he’s a force. Firstly, it’s important to note that auction results do not benefit the artist in any direct way, it’s simply a tangential benefit that will increase his available market worth. So the $34.2 million will benefit Eric Clapton, the previous owner, in a direct monetary sense. At age 36 in 1968, Richter produced 95 consumable paintings in the course of the year. This includes the work in the catalog on his web site and not necessarily the not-approved paintings, the sketches, drawings or photographs that are also part of his practice. That amounts to about one painting every three and a half days or so. 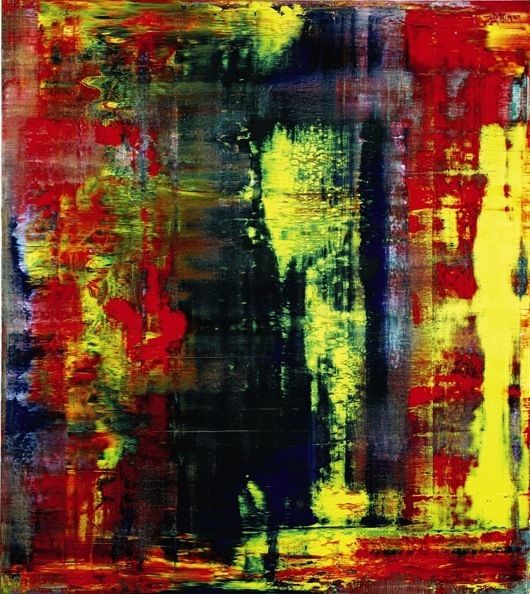 From the Collection of Eric Clapton, Gerhard Richter, ‘ABSTRAKTES BILD.’ Estimate: 9,000,000-12,000,000 GBP. Sold at Sotheby’s London on Oct. 12, 2012 for 21,321,250 GBP / $34.2 million. Image courtesy of Sotheby’s.